Best Carnival in Barra Salvador! Fab Penthouse! Amazing 180˚ Panoramic Seaview! Penthouse with amazing views, elegant, modern, and dozens of Five Star reviews! Tell us a little about yourself and your group, and the dates you're interested in, and we'll be happy to confirm prices and availability. Minimum stay normally 2 days, but there is a special package price for Carnival 2019, 28 February - 6 March, ask us now for prices! Maximum number of guests is 8. Due to variable dates possibly being selected for carnival, the correct package price may not be shown on the site, but we'll be happy to confirm this upon request! Prices should be shown in Brazilian currency, Reais, (R$ or BRL), unless your browser is set to show prices in your local currency. Our penthouse overlooks the seafront and beach, close to restaurants, bars, shopping malls, and cafes, in a historic and beautiful part of the city. A few minutes taxi or bus ride to major sights around the city like Pelourinho or Rio Vermelho, as well as being 200 metres from one of the main circuits of the carnival, Barra - Ondina. With more than 180 degrees of ocean view from our terrace, this is an ideal spot for a short or extended stay in the city. Fast wireless internet means you can enjoy a caipirinha while working or watching the beautiful sunsets Salvador has on offer, just for you. The apartment is self catering, spacious, modern, tastefully decorated and equipped with WiFi Internet, HD cable TV, DVD player, and utilities like washing machine and an excellent modern kitchen. 2 bedrooms on the 10th floor: the master bedroom with en-suite bathroom, super king sized bed, air conditioning, and with ceiling fan, and the second bedroom with either a double or two single beds, according to your choice, air conditioning and a ceiling fan, and a 3rd bedroom upstairs with sofa bed and/or single or double beds, and all bedrooms with an amazing view to the sea. The living/dining area is a huge, open plan, New York loft-style beauty, with a panoramic view to the ocean through wrap-around glass doors and old Brazilian hardwood floors. The building has 2 elevators, 5 porters, two electronic gated entrances, 24 hour security, and is in a very safe, friendly, residential and touristic neighbourhood. All guests are asked to leave a copy of photo ID with us on check in, and to complete a check out on departure. We'll take you through the apartment personally, and acquaint you with everything here and around the neighbourhood and city. Only guests named at the time of reservation are allowed to visit or stay in the apartment. Change of named guests or change of dates may incur a fee or cancellation, at our discretion. Check in is normally 15:00 or later, and check out 10:00 or before. There's a one off cleaning fee of R$350 per booking. If you would like, we can also organise a cleaner or a cook for a small fee. Electricity will be your responsibility during your stay, and will be charged separately upon departure, but at cost and according to the meter reading. Security deposit of R$1000 payable on arrival. Fully refundable upon departure after inspection if there is no damage or losses in the apartment. Additional guests beyond 4 pay an additional fee per person per day, until a maximum of 8 guests. Languages: Português, English & Spanish. We're Jon and Rosana and we fell in love with Salvador many years ago. The warm sea, beautiful beaches, and spectacular sunsets, are just part of what we love about this historical city. Rosana is a fully qualified Shiatsu practitioner, and Jon is a graphic designer. This really is a wonderful penthouse with a fantastic view of the ocean and the islands in the bay, in the safe, family oriented tourist neighbourhood of Barra, with two of the best city beaches in Salvador a few minutes walk from the apartment, and with good travel links to other parts of the city, taxis and buses right on our doorstep. We're a great jumping off point for trips down the islands, or up the Coconut coastline to the northern dunes, or into the interior Reconcovo towns like Cachoeira, with it's magical beauty and Candomblé religious ceremonies, or further down the south coast islands like Morro de São Paulo or Boipeba. The terrace is enormous, the width of two apartments, 30 metres (66 feet). And the panoramic view spans more than 180 degrees of sea and ever changing skies, and as far as the neighbouring island of Itaparica. You have to experience it to believe it. And the open plan design in wrap around steel and glass with floors in old Brazilian hardwood makes you feel really a part of the amazing nature on offer in Brazil. All the bathrooms come with a bath towel set and a few basic toiletries. The master bedroom is en suite with a shower. The social bathroom is besides the second bedroom, for the exclusive use of guests. There is an optional third bedroom, and third bathroom (also with shower). There is also an outdoor shower for showering off after sunning on the deck chairs. 15 minutes by taxi to the old town and historic centre, although our own area also has it's own historic monuments, being the place the Portuguese landed when claiming Brazil. 110 yards from the ocean. Barra is one of the historic neighbourhoods in Salvador, and a popular tourist centre. Recently refurbished and very well cared for. Beautiful views of the ocean and sky. You can see the island of Itaparica clearly. Only the 3 bedrooms, but there is normally a cool breeze off the ocean in the rest of the apartment. Not suitable for kids under 8 years of age. The building is residential and the apartment has standard rules, such as, parties, loud noise or unruly behaviour not allowed; no smoking; no pets; no sub letting; no illegal activities; all guests must present and leave a copy of photo ID on check in, and do a check out on departure. Only guests named at reservation allowed to enter the apartment. Change of named guests or dates may incur a fee or cancellation, at our discretion; apartment to be kept clean and tidy; doors and windows locked when the apt is not occupied. The penthouse is stunning and we could not have asked for a better host! It was like coming to stay with an old family friend. The only thing we might have done differently would have been to stay longer to be able to take advantage of more of John's recommendations. Highly recommend! Thank you so much, Tanya. It was really a treat to meet you all, and we hope you'll pay us a return visit someday with little Leo. My boyfriend and our parents had an amazing stay at this penthouse in Salvador. The location is just perfect and Jon and Rosana are incredible hosts. They arranged travel, suggested great restaurants and helped make reservations. If you are visiting Brazil, Salvador this is the place to go. It has a unique history and has so much diversity with a nice variety of tourist activities and restaurants. Even as tourist, we were able to experience the incredible hospitality and warmth of Brazilians. At the Museum of Modern Art, we had a chance meeting with world renowned artist Bel Borba, who invited us to join him at his table. After several hours of good wine and great conversation with Bel and his friends and fellow artists, we left with more than just the standard tourist experience. None of this would have been possible without the insider guidance and suggestions of Jon and Rosana. Amazing views and wonderful hosts! My spouse and I rented this apartment in Salvador for a long weekend with his parents, and we would go back in a heartbeat. The rental is stunning, with large windows and a great rooftop deck, all facing the ocean. The bedrooms are spacious and comfortable, and the living areas are great for relaxing and visiting. The rental presents as listed, and is even more impressive in person. While the apartment alone is enough to satisfy a renter, one of the best parts of our stay was our hosts, Jon and Rosana. They went above and beyond what we expected, providing us with a list of restaurants and activities to check out, even calling places to make sure they were open over the Easter holiday. If we are able to get back to Salvador during our time in Brazil, we will definitely book here again. To echo previous reviews, while the pictures posted on here are stunning, they really are not a substitute for visiting this unbelievable city and apartment in person. Myself along with 6 friends traveled to Salvador from July 3 to July 15 to enjoy the World Cup atmosphere in Salvador, and nothing about the trip disappointed. Even with 7 of us we were very comfortable in the apartment, the views are amazing, the rooftop patio is so nice and you are surrounded by beautiful beaches, restaurants, bars, pretty much everything you need. However, to be quite frank, the only part of our trip that trumps the absolutely beautiful penthouse apartment, the surreal views out to the Ocean and the fantastic atmosphere of the city of Salvador is the hospitality of our hosts, Jon and Rosana. Jon and Rosana sent a car to pick us up from the airport, they gave us all sorts of suggestions on where to visit in Salvador, and if any of those places peaked our interest they made all arrangements with the tour companies. They also just made sure we were comfortable and had everything we needed in the apartment. Having such fantastic hosts really erased a lot of the nervous jitters that often come with long, international trips. Considering how this trip went, I would absolutely recommend this trip to anyone, and very well may be back myself at some point. Thank you so much Jon and Rosana! It was a pleasure hosting you and your group. Great guests. There is no right superlative to describing how amazing and unique this place is! First of all, I want to thank Jon and Rosanna for being such wonderful hosts. Jon has been so welcoming and helpful so that we can fully enjoy Salvador. Thank you for all your time and our nice ride together! Now, let's talk about the apartment: just breathtaking! As big travels, I can honestly say that it is one of the most beautiful place we have ever seen: the deck is just amazing, with a full view on the ocean. The inside floor plan is very convenient and the decoration very modern and clean. All what you can dream of. Our 2 daughters loved it as well. Thank you Jon for this unforgettable experience. Thanks so much for the wonderful review, and we thoroughly enjoyed meeting you and your charming daughters. We hope we will see you again in sunny Salvador one day! Thanks so much for the kind review, Mariana, it was our pleasure to host you and your friends. They were delightful company. We look forward to visiting Buenos Aires one day, and Asunción, too, of course. Abraços from Bahia! We are in Barra, a wonderful, safe neighborhood in Salvador, with a panoramic view from our terrace to the Atlantic Ocean, and the historical fort of Santo Antonio and the first lighthouse of Brazil, the oldest in South America (1698), and the city's most famous icon, the Farol da Barra. At the fort (built in 1582), there is a restaurant, a bar and Nautical Museum of Bahia and a wonderful view of the bay of Bahia dos Todos Os Santos, All Saints Bay. We are on the beachfront of the Farol da Barra , and within minutes walk of a second famous beach city, Porto da Barra, where Tomé de Sousa, first Governor-General of Brazil, landed in 1549, founding the city of São Salvador da Bahia de Todos os Santos. 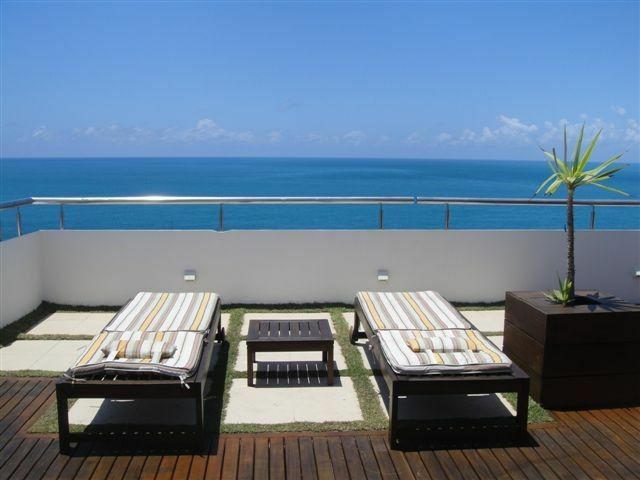 The neighborhood of Barra is in a special location, at the tip of the peninsula that is the city of Salvador. Now part of the traditional circuit of Carnival called Barra-Ondina. Barra is a predominantly residential neighborhood, upper class, although it does now host a number of small businesses, many banks - Santander, Itaú, Caixa Economica, HSBC, Banco do Brasil, Bradesco, as well as pharmacies, medical facilities, supermarkets, greengrocers, delicatessens, butchers, fishmongers, a creperie, and tea and coffee houses, and even a house of empadas, delicious Brazilian pies, plus many bars and restaurants along the waterfront. The area boasts three famous nightclubs of the city - Off Club, Europa Bar and the Groove Bar. There are many restaurants with a variety of cuisines: Bahian, seafood, vegetarian, organic cuisine, Arabic, French, Italian, Chinese, Thai, Japanese, Temakaria, Churrasco, Steakhouse, Pizza, International Buffet style, Cafeterias, even McDonalds, Subway, and Bob's Burgers. As well as delicious ice cream and cake and sweets shops. You can see and hear the New Year's Eve Party from our terrace, and there's nothing better than watching the New Year's Eve fireworks with family on our private terrace to bring great joy, peace and prosperity. The Lighthouse New Year shows are among the most famous and sought after New Year's Eve parties in the world, with performances by the great names of Brazilian music, performed in front of one of the most touristic icons of Salvador. Sun, sand and lots of fun are part of the New Year in Salvador. The capital of Bahia is the most sought destination in the northeast for tourists, who seek all the joy and magic to start the New Year. The hospitality and happiness of the Baianan people enchants every visitor. And our apartment is located a few minutes by taxi or bus from the main sights such as the Historic Center, the Pelourinho, the Mercado Modelo, and The Lacerda Elevator among others, with a host of shops, historic churches, beautiful streets, and lots of music from Bahia. There are many taxis ranks and bus stops close to our building, and in a few minutes by taxi or bus, you can be in the bars, clubs or restaurants of the nearby bohemian neighborhood of the Red River, Rio Vermelho. Check in (chegada) 15:00. Check out (saida) 10:00. Preços são mostrados apenas até 6 meses de antecedência. Taxa de limpeza e preparação de R$350 incluido no preço. Podemos organizar uma faxineira para uma taxa extra para tornar as suas férias mais relaxante. Energia será sua responsibilidade durante a sua estadia, e será cobrada separadamente na saída. Tem uma taxa extra de R$80, para cada pessoa, por dia, mais de 4 pessoas, até um máximo de 8 pessoas. Preços só até março 2019. Todos os preços em (BRL) Reais, R$. Tem um caução de R$1000.